Morning all. I took this photo from the bus as I was travelling to work this morning. 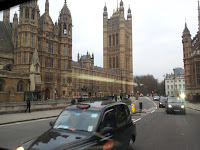 It is a picture of the Houses of Parliament. I always enjoy looking at this building. For me, it is one of the reasons I like living in South London. Everyday when I travel to work and when I travel home I see it. The building is beautiful and mysterious. The country is ruled from that building. Our politicians work there. The public can visit the building on organised tours but I would like to walk around it on my own. I'm sure there must be many secrets and things like hidden tunnels which you wouldn't see on a tour. I could be wrong because I have never tried the tour. I will, one day. At night the building it is lit up and it looks amazing. What is your favourite building? Why do you like? Describe it for us.